Arkansas Gov. Bill Clinton's presidential campaign was sidetracked again Thursday, this time over new questions about how he avoided military service at the height of the Vietnam War. For Clinton, the issue is not new -- it first surfaced when he entered politics in the 1970s. Besieged by reporters at campaign stops in Manchester and Nashua, the governor gave a calm but forceful defense of his behavior, 23 years ago. Clinton said that, after first attempting to avoid conscription, he decide to expose himself to the draft. He was never called because he drew a high number in the 1969 draft lottery. But proposed reforms in the draft system, widely publicized at the time Clinton was changing his draft status, raise questions about whether he thought he was putting himself at risk. 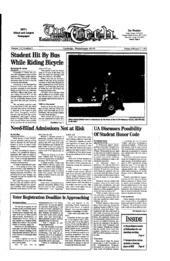 Retired Col. Eugene Holmes, then the commander of the Army ROTC program at the University of Arkansas, was quoted in Thursday's Wall Street Journal as saying that Clinton, then a Rhodes Scholar at Oxford University in England, "was able to manipulate things" so that he was not conscripted in the fall of 1969. He told the paper that Clinton had misled him into thinking he would be returning to Arkansas within a couple of months, rather than spending the entire academic year in England. Clinton, disagreeing, says he does not know why Holmes, now 75, would make such a statement. He says the ROTC commander had encouraged him to go back for his second year at Oxford, since he could not attend ROTC training camp until the following summer. Both men agree that during the summer of 1969, Clinton told Holmes he intended to enroll at the Arkansas law school and wanted to join the ROTC program there. Instead, Clinton went to Yale Law School and never joined ROTC. As a result of his oral commitment to join the ROTC, Clinton got a draft deferment for September and October 1969, the two months he had been told that he was likely to be called up. In September or October 1969, he says he changed his mind and decided not to join the ROTC unit, and was classified as draft-eligible on Oct. 30, 1969. At the time Clinton backed out of his commitment to join the ROTC, which would have required him to go on active duty after finishing law school, the Selective Service system was in turmoil, as President Nixon struggled to ease anti-war sentiment on college campuses. On Sept. 19, 1969, following meetings with top House and Senate leaders, Secretary of Defense Melvin Laird announced that Nixon intended to sign an executive order exempting those ages 20 through 26, which included Clinton, from the proposed draft lottery. Another change affecting Clinton, announced Oct. 1, allowed graduate students already in school to finish their academic year, even if they were called for induction. Clinton says he decided to give up his ROTC deferment that month because he "felt badly" about having a deferment that would last four years, since several former classmates had already lost their lives in the war. By the time the lottery took place, on Dec. 1, 1969, the rules had changed again and Clinton was in danger of being drafted. But he drew number 311; no one with a number higher than 195 was ever called. Clinton, who strongly opposed the war, said Thursday, "I was not seeking to avoid military service."